Arcanum MVCTC FFA members of the state winning team are (from left) Cael Gostomsky, Levi Walker, Ethan Garbig and Alex Weiss. 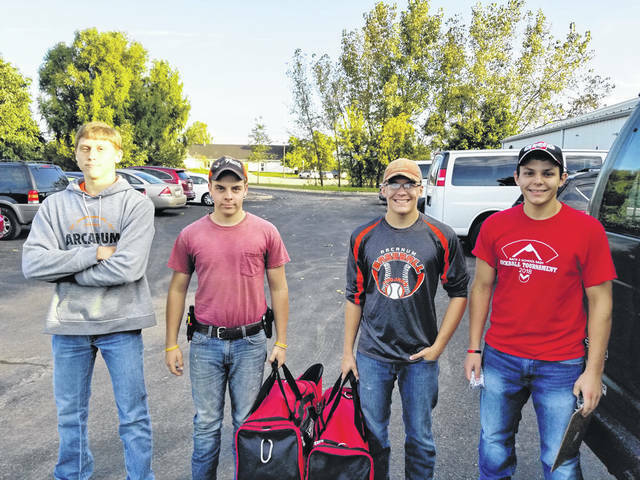 ARCANUM — The Arcanum MVCTC FFA team will compete at the National FFA Convention Oct. 24 and 25 after winning the state-level Ohio FFA Ag Technology and Mechanical Systems Contest. The members earned the right to compete in the state finals by placing in the top 10 on the online test in April. The online test included general knowledge and problem solving questions on machinery, electricity, structures, equipment, environmental and natural resources. After the online test, the team from Arcanum was in first place in the state. On Oct. 5, the top four team members — Cael Gostomsky, Levi Walker, Ethan Garbig and Alex Weiss — traveled to The Ohio State University for the state finals. During the state contest, members completed a team activity that included land surveying, manure spreader calibration, crop residue and field tile repair. Each member of the team also completed individual stations of arc welding, electrical wiring, skidsteer operations and planter calibration. Upon completion of the state finals, the team finished first in the state with Gostomsky as the first-place individual followed closely by alker in third, Garbig in fifth and Weiss in sixth. The team now moves on to compete at the National FFA Convention in the National Contest on Oct. 24 and 25. The members of the community that have helped them prepare for the contest include T and C Motorsports, Dusty Walker and Tony Gostomsky. The four team members described what was it like winning the state final. “We worked hard in order to win, so yes it is an honor to win but also well deserved,” Weiss added. All four found elements within the contest which will transfer to their future plans, with Garbig pointing out welding and electrical systems and Walker also noting the welding portion of the contest. Gostomsky said he does not really have a solid plan on for his career, but said the contest provides a very rounded set of skills which can translate into many different career paths. “As soon as I decide on what I want to do for a living will determine what college or trade school I would prefer to attend, although I am leaning towards going to a college,” he said. As for future plans, Garbig’s goal is to get a degree in construction systems management from The Ohio State University and to start his own construction business. Weiss said his future plans include getting an agriculture-based job in Darke County after college, then after a time doing full-time mission work. Walker said he is not yet sure but might do something with welding or in the trades while Gostomsky said he is leaning towards going to a college. This entry was tagged Arcanum, Arcanum MVCTC FFA, FFA, National FFA Convention, Ohio FFA Ag Technology and Mechanical Systems Contest. Bookmark the permalink.